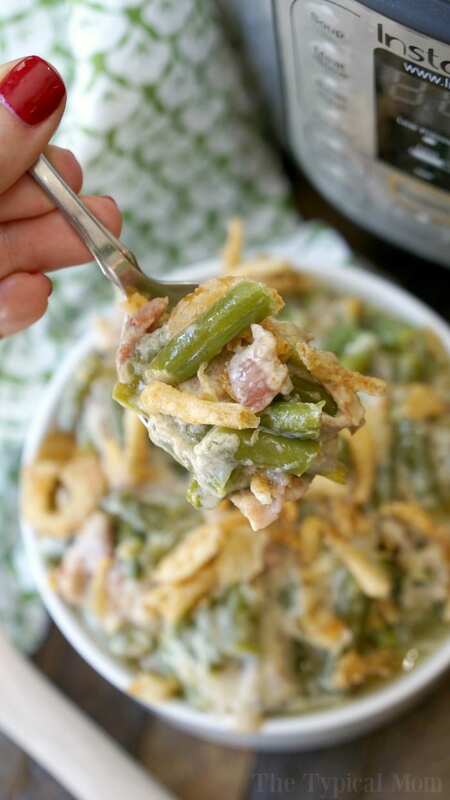 This easy Instant Pot green bean casserole with bacon recipe tastes amazing! Loaded with bacon and crispy fried onions you’ll want to make a double batch! I think there are two tricks to why this tastes so good. The bacon, and using frozen green beans instead of canned. 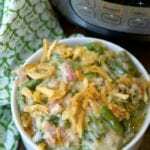 I just used my easy green bean casserole recipe and adapted it for my Instant Pot. Of course since this isn’t put into the oven it will not get that crispy fried green bean taste on the top. So if this is a must I would opt for the link above that is cooked in the oven. 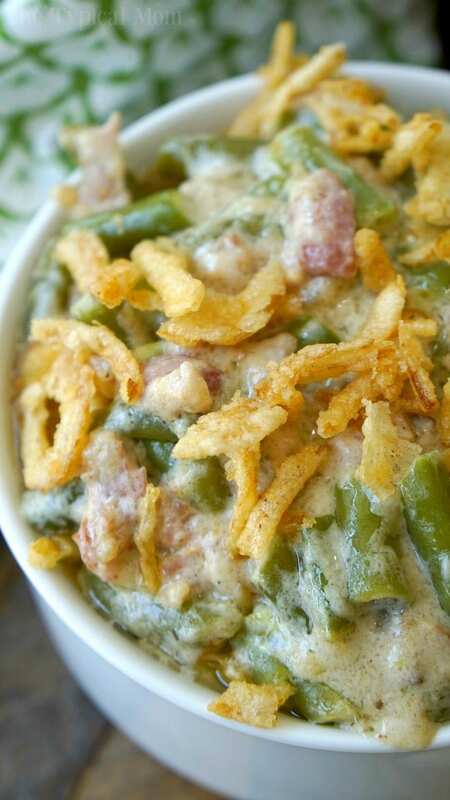 I topped this Instant Pot green bean casserole here with fried onions right out of the can to give it some crunch. But it is different of course..up to you. If you aren’t a big bacon fan…I don’t think we can be friends. LOL. No, you can just omit that if you choose (why, I don’t know). Like I said, I used to use canned green beans because I just didn’t think about it, but after using frozen green beans instead I was convinced that it makes a huge difference. It looks prettier, and tastes fresher with beans that are a bit more turgid and a lot more flavor. Choose either way but if you haven’t tested it I suggest you at least try it once. You can make this on the slow cooker function for 2 hours, the same as most other crockpot green bean casserole recipes suggest but the beauty of the Instant Pot is that it gets done faster so I like the pressure cooker function on low. I will say the bottom gets a bit brown but isn’t too hard to clean (just soak it right away). You can check out my post on how to clean your Instant Pot if you’re new to it and have any issues. Here is a video of one way I have made it but found making it on high rather than low and whisking together the milk and cream of mushroom soup beforehand worked better, so the revised version is below in the recipe card. 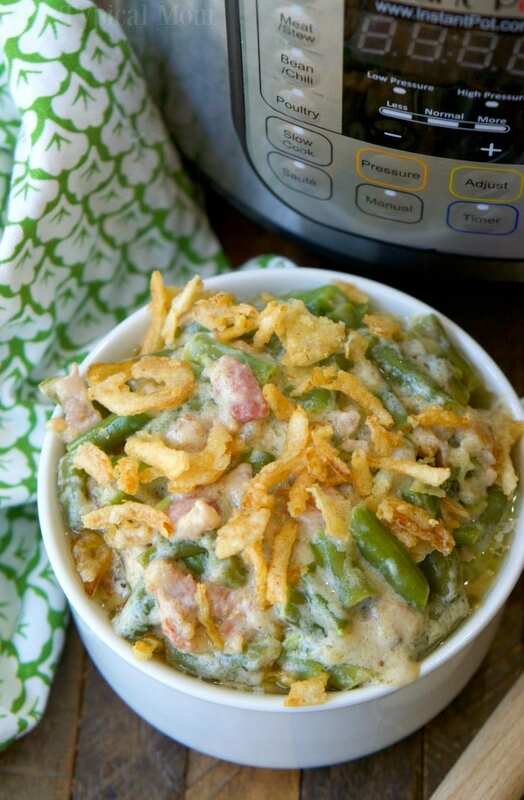 This easy Instant Pot green bean casserole with bacon recipe tastes amazing! Loaded with bacon and crispy fried onions you'll want to make a double batch! Spray the inside of your Instant Pot with non stick spray. Dice bacon and onions, set to saute, and cook until bacon is lightly browned. Drain grease (can leave in for flavor but it will be greasier at the end when done). Or just use 1/2 c. bacon bits and skip this step. Deglaze pot and turn pot off. Whisk together milk and soup. Add green beans to pot and pour mixture on top, gently stir together until beans are coated. Set Instant Pot or pressure cooker to manual, pressure, high, for 15 minutes. Quick release, sprinkle half fried onions and stir so it is inside mixture. Then sprinkle remaining on top and enjoy. I’ve made it twice now and didn’t get a burn notice either time. I used bacon pieces from the “make your own pizza” section at WinCo (grocery store). I skipped the regular onions. I then added the frozen green beans and put the mushroom soup and milk mixture on top without stirring it in. I tried making this recipe in the IP and I kept getting the burn signal. I tried two times and two times I got the burn signal. I followed the recipe minus the bacon. Did anyone else have the same problem? What setting and time would you use for canned green beans?